The global wireless POS terminals market was worth US$ 6.8 Billion in 2018. A wireless POS terminal (Point of Sale) is a digital device employed to process card payments in banks, retail stores, museums, metro stations, pharmacies and restaurants. It is bifurcated into software and hardware solutions. The software solution consists of asset management, content management and configuration solutions. Whereas, the hardware category includes workstation, payment terminals like smartphones and tablets allied with credit or debit card readers, and accessories including monitors, barcode scanners, receipt printers and cash drawers. The POS process generally begins with the scanning of a user’s information provided by their debit, credit or prepaid card. Following this, the terminal verifies whether the available amount is sufficient to complete the transaction from the user’s bank account. The transaction takes place after confirmation and the terminal stores a note of the transfer and acknowledges it with a receipt. The introduction of Personal Identification Number (PIN) and chip-embedded payment cards have minimized security-related concerns, thereby creating a positive outlook for the global wireless POS terminals market. 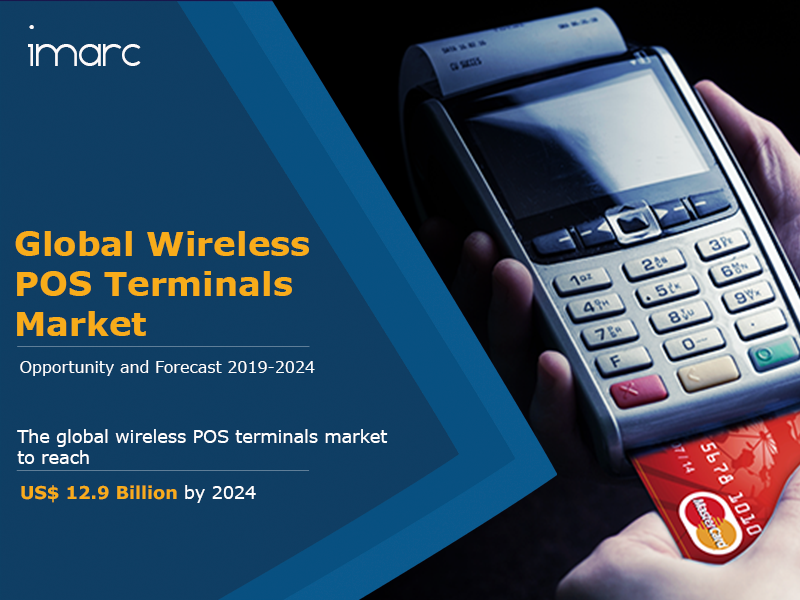 Moreover, the sales of POS terminals are being boosted by the increasing wireless connectivity coupled with the availability of peripheral devices, scanners, card readers, and printers. In addition to this, the affordable and portable nature of these terminals is a major advantage which helps in reducing the operation cost for retailers. Further, ultra-portable forms of these systems are being introduced by manufacturers. For instance, they have produced POS terminals with the size of a credit card. Apart from this, the number of people using their existing tablet/system as a POS terminal with the help of specialized software is rapidly increasing. On account of these factors, the market value is projected to reach US$ 12.9 Billion by 2024, exhibiting a CAGR of 11.2% during 2019-2024. Based on the type, the market has been segmented into Portable Countertop and Pin Pad, MPOS, Smart POS and others. Based on the component, the market has been segmented into hardware, and POS software and services. Based on the technology, the market has been segmented into NFC terminal and non-NFC terminal. Based on the industry, the market has been segmented into retail, hospitality, healthcare, transportation, sports and entertainment and others. The competitive landscape of the market has also been examined with some of the key players being Ingenico, Verifone, First Data, PAX Global Technology, NCR Corporation, Diebold Nixdorf, BBPOS, Elavon, Castles Technology, Winpos, Bitel, Cegid Group, Squirrel Systems, Newland Payment Technology, Citixsys Americas, Izettle, Revel Systems, ShopKeep, TouchBistro Inc. and Vend. How has the global wireless POS terminals market performed so far and how will it perform in the coming years? What is the breakup of the global wireless POS terminals market on the basis of region? What is the breakup of the global wireless POS terminals on the basis of type? What is the breakup of the global wireless POS terminals on the basis of component? What is the breakup of the global wireless POS terminals on the basis of technology? What is the breakup of the global wireless POS terminals on the basis of industry? What are the various stages in the value chain of the global wireless POS terminals market? What are the key driving factors and challenges in the global wireless POS terminals market? What is the structure of the global wireless POS terminals market and who are the key players? What is the degree of competition in the global wireless POS terminals market?